4.16 billion in the first half of 2016.
countries continue to rise (Chart 1). declined 1% to euro 930 million. by 8.8% from Thailand to euro 34 million. euro87 million) and Brazil (+7% to euro 63 million). the dollar and Chinese yuan. 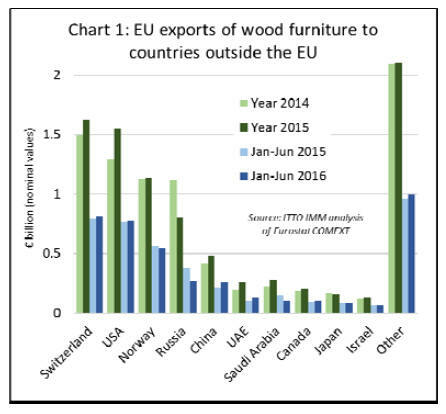 furniture from outside the single market. first half of 2016, prior to the Brexit vote. 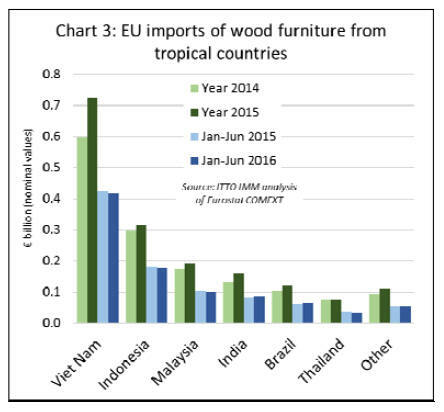 Vietnam, Malaysia, Brazil and Indonesia (Chart 4). trend in overall retail sales growth. in the three months following the vote. vote, at least in the short term. leading industrial countries in 2016.
to feed through into higher retail prices and slower sales. and outside the EU, after Brexit. data protection, food and other product safety, and so on. inevitably find its way into shelf prices”. opportunities to reduce tariffs where they currently exist. 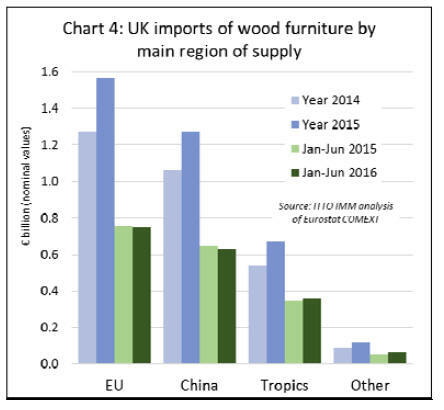 furniture which are subject to 2.7% tariff. to planed, sanded and finger-jointed sawn tropical timber. incentive to expand trade with countries outside the EU. 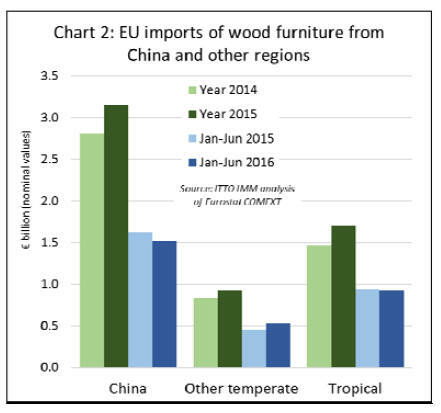 the UK market are manufacturers located in the EU. IKEA industry production units in 11 countries. from Russia and 1% from South America. Lithuania (7.5%), Russia (7%), and Sweden (6.5%). sustainably managed wood at affordable prices. paper supplied by the company. discourage a movement by manufacturers to other regions.